Wondering how to measure digital marketing ROI? Our free guide will get you started. Confused about how to evaluate the web-based direction business has taken? 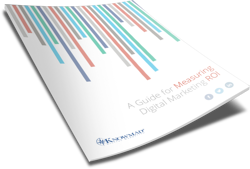 Gain control of measuring digital marketing ROI using this free guide. Which metrics are most valuable. Leading digital marketing indicators to help you predict success. By regularly measuring digital ROI, you’ll have a stronger hold on your overall marketing return on investment as well as ROI by channel and campaign. Simply fill out the form to request your free copy.